It has been over a month since we returned with My Obsession from Cape Breton and an amazing 5 weeks in the Northumberland Strait and the Bras D'Or Lakes. After we returned to PEI we only managed to squeeeze in one final day sail before we had to have the boat hauled at the end of September. October has passed in a flurry of work and activity, preparing for the colder weather which is steadily approaching. Winterizing My Obsession was a bit more complicated than it was to winterize Obsession 305. The boat systems are still somewhat unfamiliar and just tracking down all the connections takes time. Now, My Obsession sits on the hard in Souris, PEI, fortified against the wind and weather and quietly waiting for another adventure in 2012. This season saw us travel from New Jersey up the coast to Nova Scotia, around to Souris, PEI, up the Northumberland Strait as far as Buctouche and then to Cape Breton and the Bras D'Or Lakes. We sailed a total of 1750 nautical miles this season and spent 84 nights on board. The past few weeks, we have been following the adventures of our friends, Chick and Cheryl on Great Habit as they begin a year sailing in the Carribbean. We wish them fair winds and safe passages. Follow Great Habit's blog if you are interested. 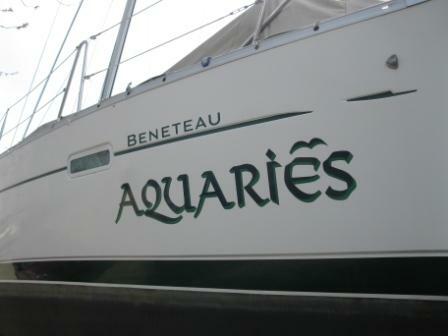 On our first boat, Obsession 305, we did some anchoring overnight, but one of the major attractions of our new boat, My Obsession, is the enhanced ability for anchoring. Earlier years, although we were pretty self-contained, our main limitation was refrigeration. Having only an ice box meant that we had to come onto land to get ice every second day, or risk food going bad. Since that meant pulling up to a dock, our routine became a night at anchor, followed by a night (or multiple nights) at dock. Now we have a refrigerator and freezer. This greatly extends our independence, and we will stay out at anchor for multiple nights. It also allows us to take a mooring when we want to be closer to land. 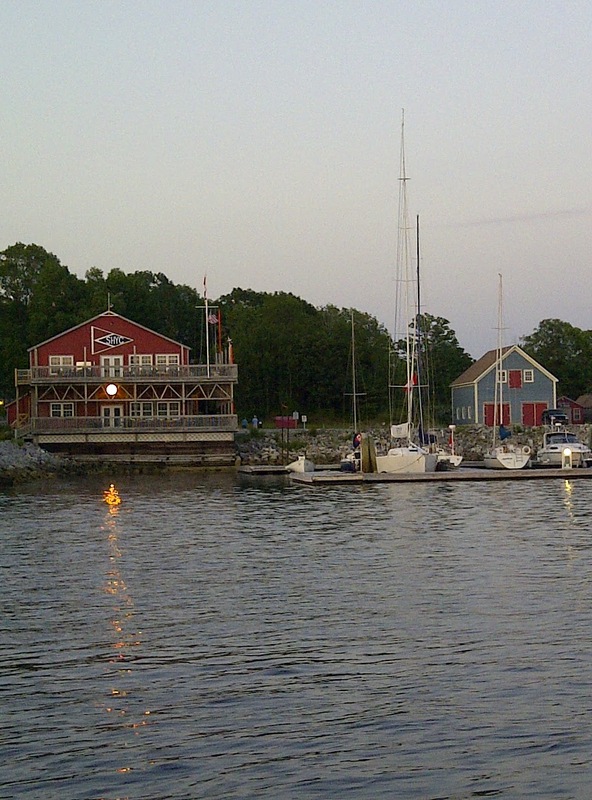 For instance, on our current trip to Cape Breton, we have been at a mooring in St Peter's instead of on dock. Since we generally spend quite a few nights here to visit family, it is a big savings - $25 per night on mooring, as opposed to about $55 on dock. That brings me to the second item that enhances our abiity to anchor - Ducky. This is our dinghy, which gives us a bit more freedom of movement without having to bring up the anchor. It also makes mooring possible, since we use Ducky to get back and forth from shore. I think Ducky has paid for himself in the one summer we have had him. 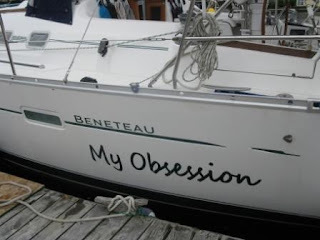 Also, handling the anchor on My Obsession is much more pleasant. One thing you learn quickly when anchoring is that underwater mud is messy and stinky. Previously, I pulled up the chain by hand. I had a dedicated pair of gloves that I used, which would get mud coated and would really smell. All that mud would end up in the anchor locker, which was always a mess. Now, we have an electric winch on the bow, which pulls up the anchor. In addition, there is a washdown hose that we can use to clean the anchor chain as it comes on board. Much nicer and cleaner than our earlier arrangement. Anchoring is so much more pleasant now, and we can enjoy the best parts of cruising more than ever before. Well, now that we are safely back in Canada I must admit I was certainly more than a little nervous about making the crossing from Maine to Nova Scotia. I was really nervous. In fact, I would even say I was scared. It wasn't the open water, or the 26 hour crossing that concerned me so much. 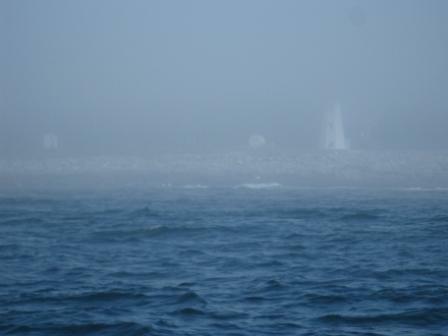 It was the idea of crossing at night on waters notorious for fog and littered with fishing buoys. But, I needn’t have worried. We left at 5am on Sunday morning after a day of rain and heavy fog in Northeast Harbour, Maine. It was clear with about 10 knots of wind. The sun was just coming up over the horizon as slipped off our mooring and motored out of the Harbour. Nothing else was moving. 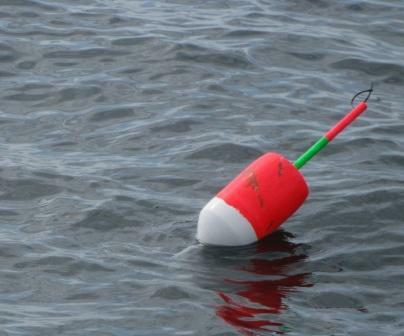 Even the water was still, the colourful buoys marking the lobster pots were hardly moving on the water’s surface. We navigated between Cranberry Island and Great Cranberry Island and out into the Gulf of Maine. The wind became a steady 14 knots. We raised the sails and settled in for a downwind sail. Before long, we caught the current and were moving along at 8knots. We were making great time - too great in fact. We had to shorten sail and slow down or we would be fighting a much stronger current rounding the tip of Nova Scotia if we arrived too early. We settled into a routine of three hour watches, with the autohelm doing most of the steering. We saw the plume from several whales in the distance, but other than three cruise ships heading in to Bar Harbour, Maine as we were leaving, we saw only one fishing trawler for the next 12 hours. There was a beautiful sunset over the water, with no land in sight in any direction. The water sparkled as the sky turned beautiful shades of orange, gold, then pink and purple. But as the sun went down, so did the temperature. Despite heavy foul weather gear, and several layers of clothing, it was cold. Jay had the first night watch and at dusk I climbed into our bunk to warm up and get some sleep. When I came back on deck at 12:30am it was like I was entering another world. The waning gibbous moon had risen and was shining brightly on the water directly ahead of us, almost as if the moon was laying a sparkling path down for us to follow home. The wind had lessened substantially and was directly behind us, so we were running under motor alone. As Jay went below, I settled in for my first night watch. We have sailed a few times at night before, but it has always been situations where we have been out sailing and returned to a familiar port after dark. This was the first time I was on the open sea at night making a passage in unfamiliar waters. We had watched the weather carefully and tried to catch a fog-free window, and we succeeded. The stars in the sky were muted due to the bright moon, but the night air was clear, and crisp. The sea had calmed from the 6 foot waves from earlier to about three feet. Including my Mustang lifejacket and underwear, I had on 9 layers. With my tuque, hood, long underwear, several pairs of socks and winter mitts, I was warm. I could barely move I had so many layers on, but I was warm. The three hours of my watch passed quickly. Several ships passed in the distance and the lights marking the shoals off the coast of Nova Scotia grew closer and closer. I rounded the outside buoy and changed course towards Shelbourne. Although I kept looking for lobster buoys, I didn't see any. However, unless one was practically alongside, I knew I wouldn't see them anyway. I was concerned that if we ran over a line it might foul the prop. I needn’t have worried though. The lobster fishing season had ended the week before. Around 3:30am Jay came back up to take over from me. By then, the cold had seeped though my layers and I was happy to climb back into our bunk and get some more sleep. By the time I came back up at 5:00am, we had crossed the US-Canada border, and the sun was coming up. I watched two sunrises in 24 hours – strange for me as I am more a nighthawk then an early bird. Jay went back for a few more hours of sleep and I kept us moving towards Shelbourne. At 9:15am, we pulled up to Shelbourne, with our yellow quarantine flag flying and called customs to be cleared into Canada. Customs officers came by the boat 45 minutes later and cleared us into the country. We had officially arrived back in Canada – 163 nautical miles from Northeast Harbour, Maine, 710 nautical miles since we left New Jersey and still several hundred nautical miles from home in PEI. I stepped ashore with mixed feelings. I was proud of myself for facing my fear of the night passage. I was happy to be home in Canada. I was sad that the US portion of our trip was over, and I was disappointed that we would be leaving the boat for 2 weeks to return to PEI to attend to some work commitments for The Turret Bell, our bookstore. I love being on the boat and hate having to interrupt our adventure. Shelbourne was a great welcome home to Canada though as Jay has an uncle in the area and cousins so we spent the day visiting with everyone. Today was spent readying the boat to leave it for a few weeks. Jay and I also did an interview this morning with Karen Mair for CBC RadioPEI’s Mainstreet program about our trip which was pretty cool. I don't know how well our words have communicated how wonderful this trip has been. It has been fun, challenging, and entertaining. We have met interesting people and enjoyed seeing the east coast of the United States from a new perspective. Although our adventure is not over, it is on a short hiatus. It will be hard to leave the boat for a few weeks. But we are looking forward to picking back up in Shelbourne and making our way up the coast of Nova Scotia to the Strait of Canso. Then the decision will be whether we point the bow to the one of our favourite cruising grounds in the Bras d’or Lakes, or whether we head for Prince Edward Island. Stay tuned. We've now made it to Northeast Harbor, Maine, on Mount Desert Island. We've decided that this will be our point of departure for Canada. So, this morning, we have been putting away the US cruising guides and pulling the Canada charts and guides from their storage places. 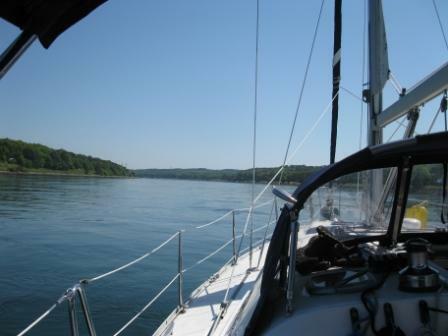 At 6 knots, we are looking at about 30 hours from here to Shelburne, where we've decided to make our Canadian landfall. We have been watching the weather closely, and it looks like we have a weather window opening on Sunday and Monday. Although the plans are subject to last-minute adjustments from updated weather forecasts, we plan to set out at first light Sunday morning. Today we were looking at tidal charts. Because we are crossing so close to the Bay of Fundy, there will be significant currents we have to account for. 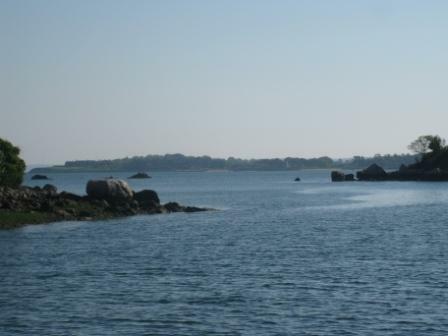 During the crossing of the Gulf of Maine, the currents will be more side-on, first in one direction then in the other. These do not affect us much, but simply mean we have to adjust our heading slightly to compensate. However, once we hit the south-west tip of NS, it is a different story. The current will be in the same direction we are travelling, so we will want to have the current at our stern and not on our bow. Fortunately, the times work with us, and the tides will be cooperating with us by the time we are in the area. As for weather forecasts, we have been monitorin both the US NOAA and Environment Canada marine forecasts, as well as the site www.passagemaker.com. Our biggest concern has been trying to avoid heavy fog, which is very common in this area at this time of year. Fortunately, we have the flexibility to wait here until there is a clear window opening. When we reach Canada, we have to deal with customs. Since we are actually importing the boat, our agent has made all the necessary arrangements with a broker, so hopefully there should be no problems. This will be the first time either of us have made an overnight passage, so there are a few nervous moments. However, one of the reasons we came this far north in the US was to minimize the time of the crossing. Often, people jump to NS from Cape Cod, which involves 2 or 3 nights. Since there is just the two of us, we wanted just one overnight before hitting land again. Besides, the cruise up the Maine coast has been fabulous. It is a beautiful area, and I want to bring the boat back here someday to cruise more extensively. 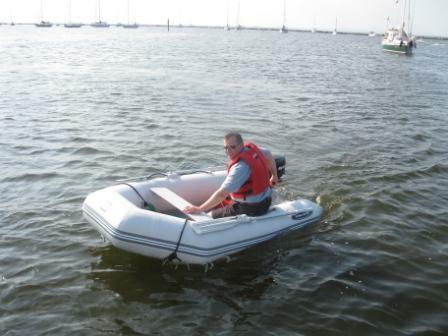 There is no such thing as an elegant way to get in and out of a dinghy. Or at least if there is, I haven't found it. The dinghy has a tendancy to float away when you step into it. This is true whether you are stepping into it from a dock or from the back of the boat. Add waves and you have a whole new challenge. Getting into Ducky from our boat, we usually have the bow tied on, as well as a line we tie to the side of Ducky, holding the dinghy snug against the stern so we can get in and out. Well, snug until the waves move them apart. The line is also helpful when we come alongside as something to grab onto and pull us close, and I use it to help pull myself up out of the dinghy onto the boat's swim platform. At a dock, we pull alongside and one of gets out with the painter in hand, and ties us off. Then we hold the dinghy alongside the dock while we load or unload. Nine times out of ten, Jay is the first one in when we leave the boat and the first one out at the dock. I am the first one in when we leave the dock and first one out when we return to the boat. Jay's legs are longer than mine and he finds it much easier to cope with the doing the splits as he gets in and out of the boat. He always holds the boat as close alongside as he can while I get in or out so my shorter legs don't have as far to reach. Sometimes, I feel I roll out of the boat more than step out, especially if the dock is much higher than the boat. Definitely inelegant. But, you can understand why tonight I thought he was doing what he always does - steadying the boat and holding it alongside while I was getting in from the dock. Except, for whatever reason, he wasn't. We had just come back from a short walk around the very small village of North Haven, Maine. 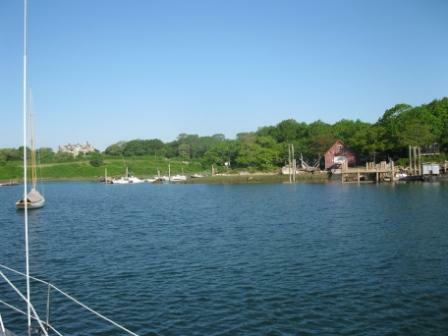 After an beautiful sail from Boothbay Harbour, we had arrived at North Haven Island, offshore from Rockland, Maine. We had taken a mooring owned by J.O Brown and Son in the narrow passage between two islands and had gone ashore to pay. This boat yard was started 100 years ago and the building and docks are showing their age. We had negotiated the decaying dock without incident and at the end of the dock, four people were gathered chatting. We stepped around them and readied to get in Ducky. I saw Jay holding the side of the dinghy and since we had an audience I didn't ask him the obvious question of whether he had ahold of the dinghy, he always steadied it for me and I was reluctant to seem like a nervous boater in front of the locals. I stepped one foot in Ducky and Ducky moved away from the dock. Much further away from the dock than I was capable of reaching. I never have been able to to the splits, yet there I was suspended in mid air, one leg valiently trying to cling to the dock and one in the dinghy. As Ducky drifted farther away from the dock, the leg on the dock lost its battle and trailed behind me though the water. I swallowed my yelp from the shock of the cold water and pulled myself fully into the dinghy, trying not to glare a hole through my husband who was smirking on the dock. My sandal and pantleg to the knee was dripping wet. We had gotten in and out of this dinghy dozens and dozens of times. Our one mishap and we had an audience. "I thought you had a hold of the dinghy," I muttered, studiously avoiding the curious gazes of our audience. Jay chuckled, pulled the dinghy closer and stepped in without incident, adding insult to injury in my mind. Ok, I know we were spoiled when we were in New Jersey. It was the end of May and it was 30 degrees Celsius. Now, I love the warm weather, so I was perfectly content. Jay on the other hand likes it more about 20 degrees or so. Unfortunately for both of us, it has been raining alot and in the low teens for the past 5 days. We spent 4 of those days in Portland, and today we had our coldest crossing yet. We left Portland at 9am and in the mist and light rain with 15-20 knot winds and we headed for Boothbay Harbour, a mere 35 nautical miles away. I had 5 layers of clothes, a wool hat and winter mittens on, and still felt chilly. I guess that makes me a fair weather sailor. No sailing in the artic for me! This photo was taken before I resorted to the wool hat and mitts, but you get the idea. We arrived in Boothbay Harbour, a very pretty little town with lots of shops, restaurants and whale watching cruises about 3pm and took a mooring at Tugboat Inn Marina. We took Ducky down from the davits and went ashore to explore. My big purchase was some warm slippers to wear on the boat. With this weather, my feet have been cold and I hate wearing boat shoes below decks. We are picky about footwear on the boat. We have our sandals or sneakers for going ashore, but they are never worn on board. We have our boat shoes for when we need to wear something on the deck because of the cold, but we prefer to go barefoot when aboard if we can. However, 10 degrees Celsius does not lend itself to bare feet! We had dinner at a wonderful italian restaurant called Ports of Italy in Boothbay Harbour tonight. The food was delicious! Unfortunately, when we left the restaurant, it had started to rain. Luckily for me, I had taken my rain pants ashore, so I didnèt get my bottom wet on the dinghy ride back out to the boat. So now I am sitting at the table in the salon, listening to the gentle patter of the rain on the hull. It is warmer now that we are out of the wind, so between the nice hot meal, my comfy new boat slippers and the warmer air in the boat, I have finally thawed out. It hasn't just been the weather that has changed since we left New Jersey. It is interesting how the coast changes so much between New Jersey and here. The coastline there is very sandy. Here it is very rocky, reminiscent of Nova Scotia. We are seeing less recreational boats out on the water right now as it is still early in the season here. We are seeing lots of lobster boats, ferries and whale watching boats. We are also getting extremely good at dodging the colourful lobster pots which riddle the seas here, even in the middle of the channels. Tomorrow, if the weather holds, we will continue sailing north. There are so many beautiful places to explore in Maine that we wish we had more time. We are already talking about making another trip back here in the future to explore the coast more fully. 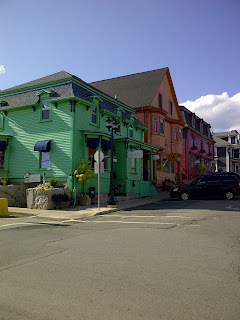 A couple of weeks before we left home, I went into Charlottetown to write a test. I had purchased the self-study package for advanced navigation from the Canadian Power Squadron. The course was Advanced Piloting, which covers navigation and charting. The tests are sent off for marking, and I haven't heard the results yet. Boy, I hope I passed. Because since leaving New Jersey, GPS receivers have been an issue. The boat came with a chartplotter. This is a GPS unit that is mounted on the helm station. It has a 7 inch screen, and all the nautical charts for the US coast we are travelling. It superimposes your position on the chart and allows you to plot things like your intended route and direction of travel. It is really a very useful piece of electronics, particularly in unfamiliar waters. Remember the thunderstorm from the earlier posting? Well, for a while the rain was coming almost horizontally. This is when we discovered that the case was not entirely watertight. Later that evening, the screen fogged up on the inside, indicating moisture had gotten past the seals. Although it worked for the rest of the day after the storm, it hasn't worked since. But, that's not insurmountable. We also own a handheld Garmin GPS. We have a mount for this to put it next to the wheel, and in fact, this is what we have been using exclusively for the past few years. We also have the navigational charts for this unit, and it gives pretty much the same functionality, but with a much smaller screen. Only one problem. A couple of days ago I dropped this GPS, and it has not worked properly since. So we're onto our third backup, which we only took along as an afterthought. This is a much older GPS, but doesn't have as much functionality, nor does it have all the charts. So, all day yesterday, we were resorting to good old-fashioned 16th-century style navigating to travel from Little Harbor to Portland. Now that we're here, we will address the GPS issue. But we made it safely, so that's a passing grade in my book. We ended up staying two nights in Provincetown. The second day we went ashore in the morning for a shower, then wandered around on Commercial Street downtown, wandering in and out of the eclectic mix of shops. 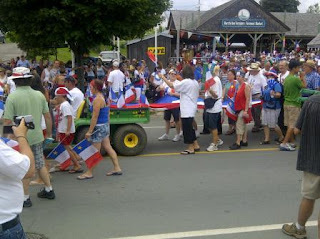 What a colourful town. We went to the supermarket and got another couple of jugs of water then took a taxi back to the marina. Ducky carried the heavy load back to the boat without any incident. The afternoon was blazing hot, so we stayed on the boat, enjoying the sea breeze. Jay took a nap and I took care of a few things that needed attention around the boat. Around 5pm we moved the boat to the fuel dock to fill up and then Jay made chilli. It was another beautiful evening in the cockpit. We turned in fairly early, knowing we wanted to get up early to leave the next morning. Neither of us slept very well however. The wind picked up to about 15 knots around 2am and the banging of the cockpit locker we had left open for the wifi antenna woke me. I went above to close it and then had a really hard time getting back to sleep. By 5:30am we were up. We lifted Ducky on the davits and motored around the pier to the slips on the other side so we could fill our water tanks. Our stern tank had gone dry just before bed. After filling the tanks, we set out for Isle of Shoals. The weather was overcast, with a bit of a cool breeze on the water. 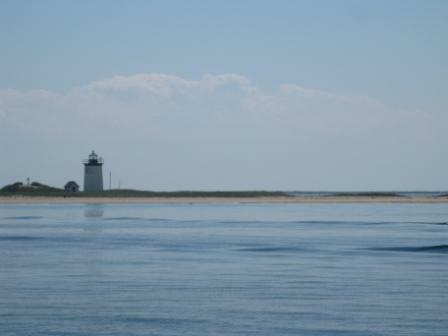 Coming around the tip of Cape Cod, the seas were confused and about 3 to 4 feet. They settled into one direction and smoothed out after an hour, but were about 4-5 feet with the odd one even larger. By late morning they seas had calmed to one to two feet and we had a nice breeze for sailing. We periodically listened to the weather on the VHF and what started as a chance of thunderstorms, became a watch for severe thunderstorms. The forecasted wind direction for overnight also changed so we decided to skip Isle of Shoals and head for Little Harbour, just 6 nautical miles further on the coast. As we were about 7 nautical miles out, about 5pm, the sky, which had been gradually darkening, took on an ominous cast. We furled in the sails and even as we were tidying up the lines, the wind hit. It went for 15-20 knots of wind to 40-45 knots of wind in about two minutes. We even saw gusts of 55knots (which is 100km). We had pulled in the sails just in time. We had pulled on lifejackets and we tethered ourselves into the cockpit. For the first 10 minutes, it was just the wind. Earlier in the day we had stripped the canvass off the bimini and we were really glad we had. One gust of wind managed to spin the solar panels, but thankfully they did not break off. As the boat was getting tossed by the wind, the lightning and thunder started. As the lightning drew closer the skies opened and it started to pour. The lightning drew close enough we put the engine in neutral and lashed the wheel and headed below. We had a handheld GPS below which was showing us we were doing 3.5 knots even in neutral, just from the wind. We watched the handheld closely as the wind was blowing us towards the Isles of Shoals - a lee shore. The sky was filled with sheet lightning and fork lightning and the rumble of thunder. The boat was tossed around, but was handling the weather better probably than we were! It is nerve wracking to be on the water in a thunderstorm, but we had taken all the safety precautions we could. After 15 minutes, Jay braved the storm to make a quick adjustment to our course as we were coming closer than we were comfortable to the rocky islands. The lightning was beginning to move off in the distance. After about 40 minutes, the worst of the storm had passed and we were able to go topside again. We had travelled almost 2 NM off course as we drifted with the wind. We turned the boat and retraced our steps. Within another 30 minutes the seas had calmed and the sky had lightened. 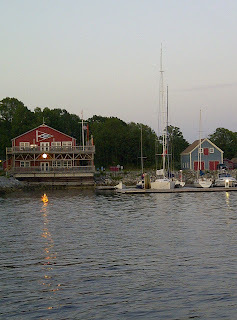 We motored into Little Harbour, New Hampshire and grabbed a mooring at 7pm. Whew! I have no desire to repeat that experience on a regular basis, but both we and the boat handled the weather without serious incident. There is some moisture in the chartplotter after the torrential rain, so hopefully that will dry out without a problem. Also, we need to reposition and tighten one solar panel, but considering the strength of the wind, we all handled it just fine! No thunderstorms are forecast for tomorrow. The best part is that after 392 NM we have finally seen some marine life - several dolphins and several whales! Let me introduce you to a new and very popular member of our crew - Bad Boy. Without Bad Boy, our lives would be much more challenging and complicated. Even though we are cruising up the US coast, we are not completely on vacation. We tried our best to clear up as much as possible before we left, but since we have three businesses between us, we are still on call. Also, although we tried to minimize our workload for this month, we still have some deadlines and tasks to meet. This is where Bad Boy comes in. Bad Boy is a system, targetted for marine use, that lets us pick up internet signals from our boat. Bad Boy consists of two components. The first is an antenna that picks up any internet signal in the area. It will focus on any open signals first, but you also have option of connecting to any secured systems if you have the password. The second component is a wireless router. Our boat now is its own internet hot spot. We can access internet from each computer independently. How well does it work? If there is a signal around, very well. It picks up multiple signals that our laptops cannot. For the three days we were in Newport, we had internet the whole time. That allowed us to spend a few hours each day doing work. As I'm writing this, we are in an isolated area of Massachusetts, but still accessing a weak internet signal. We were able to do some work earlier this evening. Because of our day jobs, we cannot allow ourselves to be totally disconnected. We have only had Bad Boy for a week, and he's already proven his worth. After some serious and difficult consideration, we decided to spend another day in Newport. All right, it took about two minutes to decide to stay longer than originally planned. What can I say, we both like it here. We've made good use of a facilty here called the Seamen's Church institute. This is a facility set up to serve all sea farers. For $2, you can get a nice hot shower. Breakfast and lunch are available for very reasonable prices. Laundry facilies are available. There is even a chapel and a beautiful library. Although we do have a shower on board, hot fresh water is at a premium while we're out on a mooring. The hot water heater on the boat works in two ways - by electricity or by using the engine heat. Well, at a mooring we don't have the option to plug into shore power, and we don't have the engine running. Hence, a limited supply of hot water. So, we've really appreciated being able to take a shower in the mornings. We started by making a run past the Maltese Falcon. This really is a beautiful and amazing ship. In the afternoon, we decided to make a trip out to the West Marine here in Newport. There were a handful of items we have wanted to pick up for a while, but there in not always a convenient marine store. There is a marine store here in downtown Newport, but it is small, so we wanted to go to the larger store. It is about three miles from downtown, so that meant taking a cab. The cab was waiting while we were inside, so we quickly recruited one of the salespeople to help us find what we were looking for. We let her know we had a cab waiting, so we were in a rush. The three of us were running around the store, picking up items from our list. We lucked out, and had approached one of the managers, so she actually gave us a discount on a couple of the more expensive items. I think she was having fun as well, running from one end of the store to the other, trying to minimize the time we spent inside. Also, I've been going through a bit of hockey withdrawal. It's Stanley Cup Final time, and for the first time in a long time, a Canadian team is the favourite. So, last night, we decided to give Ducky a rest and called the lauch service. They came and picked us up and we found a pub showing the game, so I got to see Vancouver take game 2 over Boston. This is definitely Bruins territory, so we were the only ones in the place cheering for Vancouver. But, we were also the only ones going home happy. When we went out, I wore my St Peters Fire Department shirt. It's a collared shirt with the crest on the breast, and is quite a nice and comfortable shirt. While we were in the pub, I had someone come up to me and ask if I was a firefigher. When I answered yes, he shook my hand and expressed his appreciation for the fire services. It's always a nice feeling when something like that happens out of the blue. 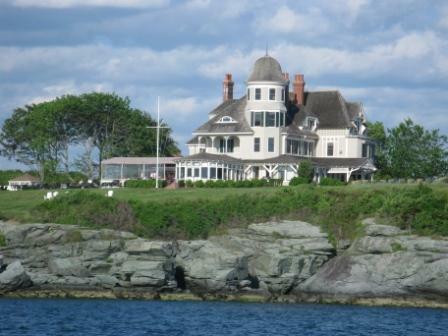 Besides its sailing tradition, Newport is also famous for its mansions. This was where the rich and famous industrialist from a century ago would come to get away, and did they ever leave their mark on this city. Some of these buildings are breathtaking. Most of these old houses are open for tours. We didn't take these tours this trip, but it will be a priority next time we are here. Anyway, tomorrow we are moving on again. We are planning on anchoring in Hadley Harbour, south of Cape Cod. 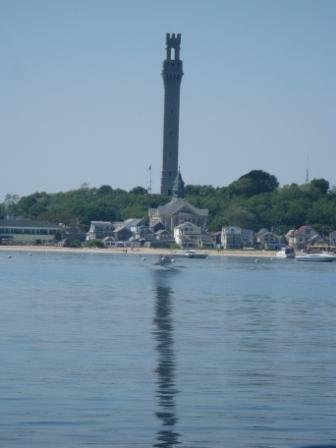 The day after that we'll travel throught the Cape Cod canal and move up to Provincetown, Mass. We've enjoyed our brief layover in Newport, and will definitely be back again. I am in the same mooring field as the Maltese Falcon! 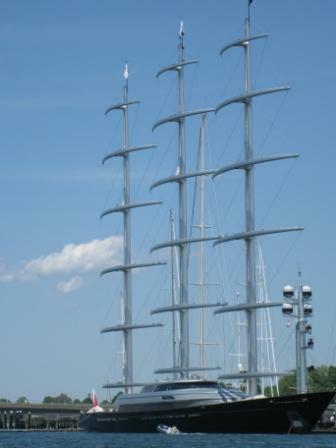 This 289 foot sailing vessel is amazing to behold. 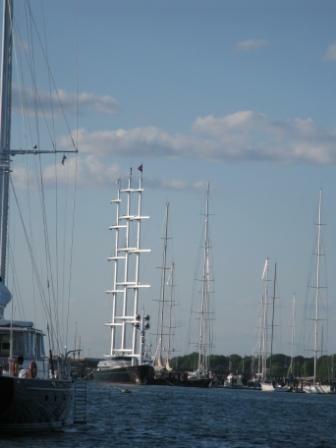 It is in Newport, Rhode Island with us tonight and moored only a few hundred feet away. Very cool! I took this shot of its distinctive three free standing masts from our cockpit. Tonmorrow I will try for a closer photo and maybe zip by in Ducky, the dinghy. 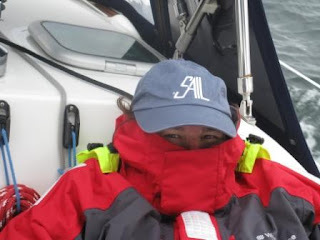 The wind was chilly, so we bundled up for the first time since starting our voyage north, but the sun was shining and the wind was perfect for sailing. It was wonderful actually being able to sail for most of the day instead of motoring. We sped along the coast and by 6:00pm we were entering the Newport Harbour, passing gorgeous homes on the cliffs, dodging sailboats everywhere and entering a harbour that is filled with boats of all sizes and shapes. We hailed the Harbourmaster on the VHF who escorted us to a mooring ball and for $40 a night we are settled in for a visit to Newport. I am looking forward to it. 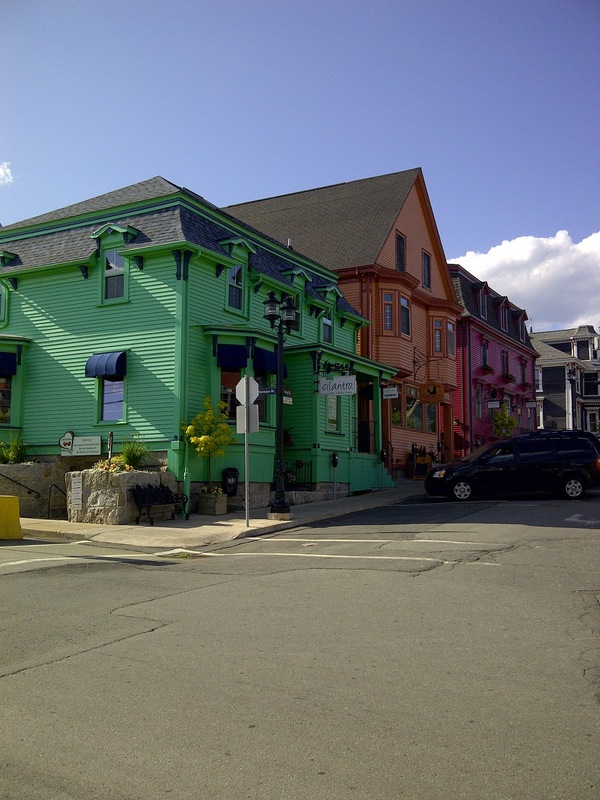 Newport offers restaurants, galleries, historic mansions, walking tours, shopping and more. There is a fabulous cliff walk that takes you by beautiful mansions and amazing waterviews. There is so much to see and do I know our stay will not be long enough. We spent an aftenoon here on our way back to Canada from viewing the new boat last month and we loved it. We promised each other we would come back and explore more when we were moving the boat north and here we are! 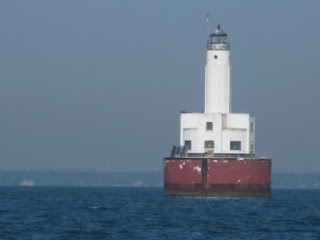 Yesterday we left Port Jefferson, New York and headed for New London, Connecticut, about 56 NM away. The wind was variable, from 7 knots to 12 knots, and gusting to 20 knots. After sailing for awhile, we decided to motor sail. We had left a bit later than we had planned and thunderstorms were forecast for late in the day. With the added speed from the engine, to offset when the wind speed dropped below 7 knots, we made good time, averaging about 7.7 knots of speed. The sun was shining, but the wind was cold. The passing was rather uneventful - my first rope burn ever when letting out the mainsheet, a broken reading light when Jay tried to open the back to put in batteries and a broken handheld GPS when Jay dropped it in the cockpit being the only casualties. The real excitement began when we less than a nautical mile from the lighthouse marking the entrance to New London Harbour. It was about 6pm and the sky had gone from partly cloudy to completely grey. Dark clouds were approaching from the south on our stern. The waves were not high, but had been tossing us around a bit for the better part of the crossing, making it tough to stay on course, so someone had to be on the wheel constantly. We had been watching the sky darken to the south and had been hoping we could outrun the approaching bad weather. The wind dropped off completely to 3 knots and we furled in the sails, running under power alone. We revved up the engine and made a last ditch effort at out running the weather, an effort we knew was destined to failure. Within minutes, visibility dropped to less than a half a mile. The skies opened and torrential rain and hail started. Lightening flashed in the distance. Out of the fog in front of us emerged a ferry. We were not in its path, but the lack of visibility made the decision for us. The radar was so full of interference from the rain we could not rely on our ability to read it and although the chartplotter is a good one, neither of us fully trust it the way we did our now useless handheld GPS as the charts render differently on the display. We were not going to try entering an unfamiliar harbour under those conditions. We turned the boat, heading for open water, hoping the storm would be short lived. But between us and open water on all sides were several rocks, so Jay stayed above on the wheel while I ducked in top the companionway. Not that it mattered. We were both soaked. We had only pulled on jackets, not full foul weather gear, and the dodger and bimini affording minimal protection from the driving rain. So, I huddled in the companionway, hoping that the lightening would not get too close. About ten minutes later, the skies lightened and the weather passed on. The rain stopped and visibility improved dramatically. We quickly headed for port. On the way in we passed a boat setting up a race course and several sailboats getting ready for what was obviously a club race. I admired their commitment. Looking at the sky it seemed we might be in for another thunderstorm before the evening was over. 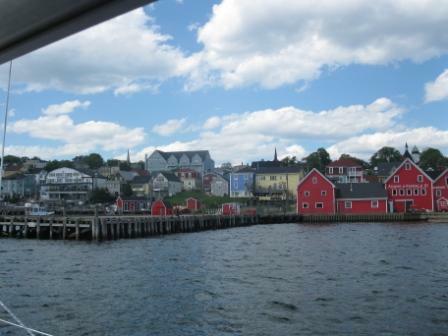 As we entered port we headed for the Waterfront Park, right downtown, which was advertised in both cruising guides as having town moorings and amenities. When we picked up a mooring it was covered in barnacles and we could not raise anyone on VHF or by calling the phone number printed in the book. We decided to move to a nearby marina to get fuel and water and maybe take a mooring there. However, they too were not answering a hail on the VHF or the phone. In the meantime, the race has begun, so we figured maybe they were all out racing. The skies opened again for another quick rain shower. We took a mooring and made a quick dinner on the BBQ, figuring if we were on someone's mooring we would just move and that maybe once the race was over we could reach someone on the VHF or phone. We had looked carefully at the areas marked as anchorages on the chart, but they were all filled tightly with mooring balls. Just as we finished eating, the race was ending and the boats were coming back in and another thunderstorm hit. A launch gathered racers from the moored boats and everyone scrambled for shore and shelter. We still could not reach anyone at the marina. The fuel dock was closed up tight. However, we had become quite aware of the pitching and rolling the boat was doing. The mooring field was more exposed to the elements than we liked. It was dark and none of the other boats looked like cruisers or seemed to have any people aboard as they bucked like wild horses on their mooring balls. I don't mind a little rocking to sleep, but the mooring ball was intermittently tapping the side of the boat. The wind and the current were working against each other and we were not swinging as we should on the ball. Jay suggested we move back to the town moorings where it would be more sheltered. So at 10pm, we slipped off the mooring ball and motored the 1/2 mile or so back into the centre of town. Despite the railway track, the mooring field was calm, better sheltered from the wind, and empty. We picked up a mooring ball and fell into bed. This morning we expected someone to come by and collect the posted $35 mooring fee, but no one did. Nor were the bathrooms ever opened. Obviously, we are out of season for the town's Waterfront Park. But there is a dinghy dock and so we went into town for lunch and a few errands. The forecast was for 20-25 knot gusting to 30 today in the Sound, so we decided to stay in New London. We had lunch on a lovely outdoor patio, but the wind required us to hold down our glasses, napkins and food! Unfortunately, the laundromat was too far away to walk, so I guess laundry will wait until tomorrow in Newport. But we did explore the downtown. And get a few errands accomplished. New London is very much a working town, well known for its submarine building industry. Several ferries leave from here to Block Island and Fishers Island. 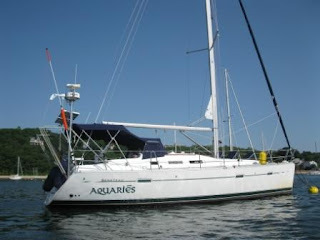 To time the current around Fishers Island we need to leave late morning for the 48 nautical mile trip to Newport, Rhode Island, so we will get fuel and water tomorrow on our way out of New London. We will go north of Fishers Island, so we will not be going through The Race; however, currents are still a factor.